WABI”. – Dirty wet dog , boats and sailing. 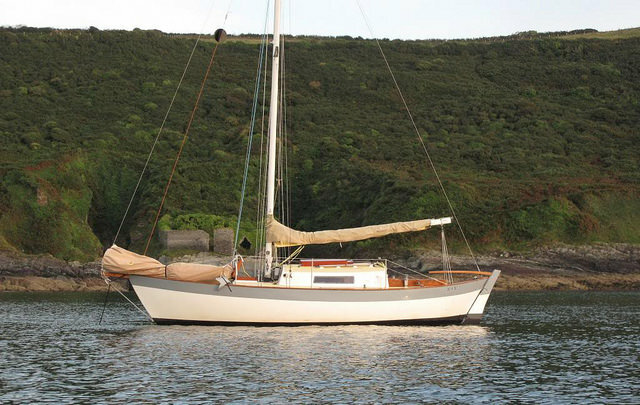 Here is my previous boat WABI” (wabi 2) which is a Frances 26 : a boat designed by Chuck Paine originally for himself and then built as a production version in the US firstly and in the UK for a while until it became a Victoria 26 with a long and ugly cabin. This is not only the boat i always wanted for myself but the version of the boat that i wanted as well with a completely open interior and a cutter rig. This boat had a total refit over the time i owned it : new rigging and sails, new engine, mostly new electrics, brand new windvane, a completely re-done interior etc. My intention was that his would be my long term home and that i would have sailed ‘towards’ New Zealand when i retired. As it happens i had 6 weeks cruising south Brittanny and then sold her so that we could buy a cottage here instead. Lovely interior : light, open and clean. It was obviously bacon butty time when i took these pictures and i must have been working on the icebox just aft of the forward bunk to stb while living aboard. I learnt so much from doing this refit as i just couldn’t afford to have other people doing the work : thus i had to learn how to fit an engine, do 12 volt wiring, laminate and build new parts in ply-epoxy. The Frances is truly a great little offshore and ocean capable boat that while never feeling fast just seems to eat up the miles and look after its crew. Would i have one again ?probably not because now i understand and appreciate the ability to sail in very shallow water and dry out flat . One of the best comments i ever had was when local hero Pete Goss paddled past in his sea kayak one day and stopped to chat…even he said he had always wanted one !